Every year about this time, the great debate starts about exactly how you should boil an egg. There seems to be divided opinions on this subject, and I have to admit my favorite resource is my grandmother, who I call almost every time I boil one. This year, after reading a very confident discourse by another foodie (who was not at all consistent with what grandma does), I decided to play with my food and see what kind of difference time really makes. One dozen eggs, one pot for boiling water. What makes a good boiled egg? Like many things that comes down to a matter of opinion. Ease of peeling is important to some people. The best way to accomplish that is to not use really fresh eggs. 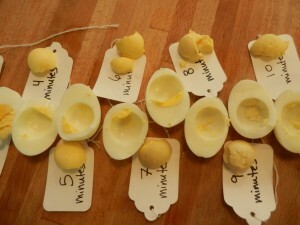 As an egg ages, the membrane separates from the shell making it considerably easier to peel. Adding salt to the cooking water (I used 1 TBSP) helps with this too. The results: Boiled Eggs. But which is best? Regardless of your preferred cooking time, start with cold water— enough to cover your eggs in a single layer. Add 1 TBSP salt to the water and then bring the water to a rolling boil. After the rolling boil is reached, place the lid on the eggs and allow them to sit for the desired number of minutes for your preferred level of done-ness. 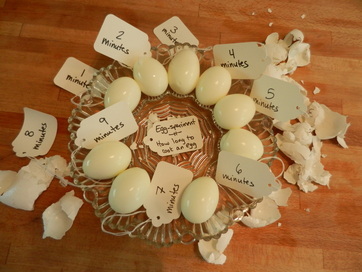 For my egg-speriment, I started all eggs in this way. I then pulled out one egg every minute to see exactly how things were progressing with the level of done-ness. The large eggs I cooked were “done” much faster than I expected. I really thought the one-minute egg would be a gloppy mess, but it was just a little darker and more damp in the yolk than the others. I worried about the color change that occurs when the yolk and the white react—this happens more when the eggs are cooked longer. But it was barely noticeable around the 7 minute mark and after with the eggs I cooked. At first, the yolks were also a little too crumbly (before 3 minutes); then perfect (at 4-6 minutes); and then more dry and crumbly again. I still followed grandma’s advice and plunged the cooked eggs into ice water as soon as they were finished cooking. Depending on who you ask, this may a) prevent discoloration, b) make peeling easier, or c) both. You can actually see the difference in the color and texture of the eggs. 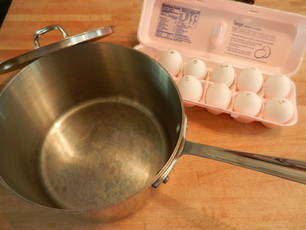 Boil eggs in a saucepan with cold water and salt. Once a rolling boil is reached, cover with a lid and turn the burner off. 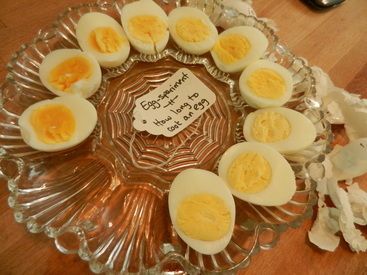 Allow eggs to sit for 5 minutes before draining them and adding ice water.